One of the recurring themes in Tolkien’s legendarium is that history, if not repeating, at least rhymes. Everything that happens is imbued with a shade and memory of the epic tales of yore. The world is filled with archetypal models that appear and reappear, creating an echo of resonance across time and space, sweeping up our daily lives into the grand narrative. In our first card feature, we discussed Daughter of the Nimrodel and saw how the love story of Aragorn and Arwen recalls and relates to the earlier tale of Lórien’s fair maiden. Today, we will turn to the shadow side of the Core Set and explore a card whose history reverberates even further back into Tolkien’s lore, perhaps as far back as any reference in the game. Arachnophobes beware! The following paragraphs contain images of larger than life spiders that may disturb or terrify you. We’re visiting the original villain of the LOTR LCG – Ungoliant’s Spawn! For other foul creatures of spider form had dwelt there since the days of the delving of Angband, and she mated with them, and devoured them; and even after Ungoliant herself departed, and went whither she would into the forgotten south of the world, her offspring abode there and wove their hideous webs. This quote is taken from Chapter 9 of the Quenta Silmarillion titled “Of the Flight of the Noldor”. 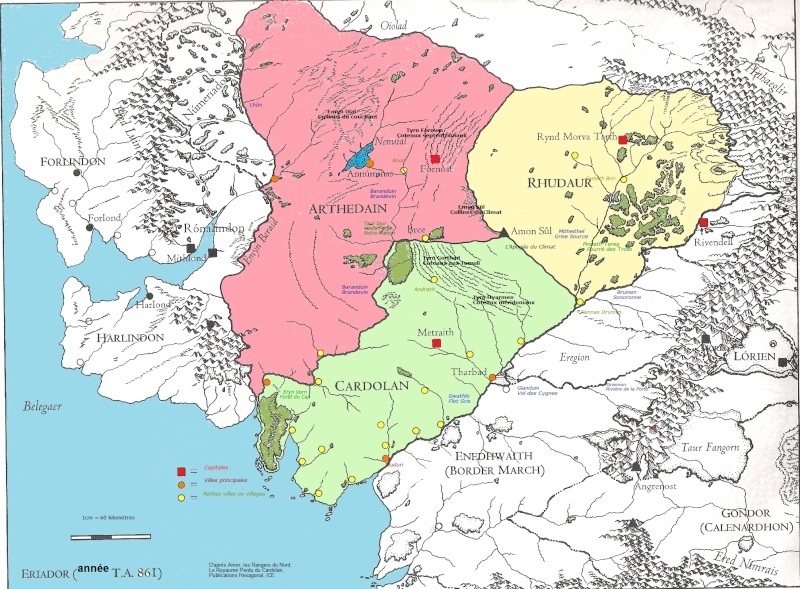 It is a dark time for Arda, both figuratively and literally, as Ungoliant and Morgoth have just destroyed the Two Trees (which provided light in the First Age before the Sun and Moon existed), stolen the Silmarils (in which the last light of those Trees remained), and escaped across the sea to Middle-earth and the ancient ruins of Angband. But the lore of Ungoliant goes back even further than this. We are told that the Elves “knew not whence she came” though legends concerning her suggest that she is some kind of manifestation of the Outer Darkness that was corrupted “in the beginning”. 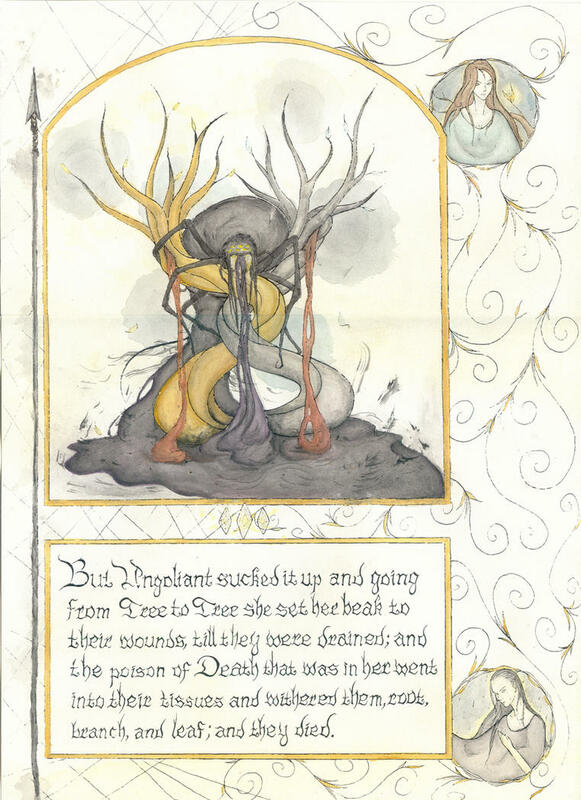 Just in case association with childhood terror is not enough to make Ungoliant sickening and disturbing, there are three further themes consistently evoked by Tolkien’s text that makes this spider mistress utterly repulsive – darkness, gluttony, and lust. To begin with, Ungoliant is said to “have descended from the darkness that lies about Arda”. She is the enemy of light and “hated it”. Even while the Two Trees still blossomed, she lived in the far south, where she “sucked up all the light she could find, and spun it forth again in dark nets of strangling gloom”. As shes flees Valinor, Manwë looks out and sees “a Darkness beyond dark” as “the Cloud of Ungoliant” leaves the Valar “blinded and dismayed”. With these words, Tolkien gives us an impression of Ungoliant as a black hole, the absence of light, unceasingly able to take pure light and twist it into her “evil nets”. It is clear, however, that Ungoliant didn’t just hate light, she “hungered” for it. Her insatiable desire is emphasized through distinctively gluttonous references which portray her “taking all things to herself to feed her emptiness”. Yet even when she eats all the light that can reach her, still she is “famished”. Although no one knows the final fate of Ungoliant, it is said that in the end she ceased to exist only when “in her uttermost famine she devoured herself at last”. The final characteristic of Ungoliant that Tolkien summons is both the most nauseating and most relevant to the lore of our particular card. She is a “mistress of her own lust” whose “foul offspring” have now populated the dark places of the world. When Ungoliant settles in Middle-earth after fleeing from Valinor, she dwells below the Ered Gorgoroth or “Mountains of Terror”. There she finds “other foul creatures of spider form” and “mate[s] with them” and “devour[s] them”. The most infamous of these spawn is Shelob the Great, the “last child of Ungoliant to trouble the unhappy world” who Frodo and Sam must confront in The Lord of the Rings Book IV Chapter 9 “Shelob’s Lair”. It is here, in the passage which introduces Shelob, that we will find the nasty origins of our Ungoliant’s Spawn. But still she was there, who was there before Sauron, and before the first stone of Barad-dur; and she served none but herself, drinking the blood of Elves and Men, bloated and grown fat with endless brooding on her feasts, weaving webs of shadow, for all living things were her food, and her vomit darkness. Far and wide, her lesser broods, bastards of miserable mates, her own offspring, that she slew, spread from glen to glen, from the Ephel Dúath to the eastern hills, to Dol Guldur and the fastness of Mirkwood. 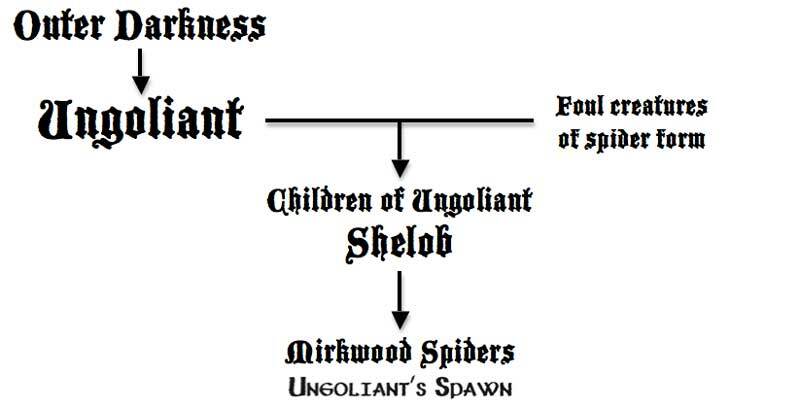 Based on these passages from The Silmarillion and The Lord of the Rings, I have created a simple family tree for our first and favorite LOTR LCG villain, that incestuous arachnoid, Ungoliant’s Spawn. Before moving on from the lore, there’s one more tale that needs to be told, because we will refer to it during our thematic play section later on. When Morgoth persuades Ungoliant to sally forth from her shadowy webs in the south to join him in the assault on the Two Trees of Valinor, he promises to give her “whatsoever [her] lust may demand”. 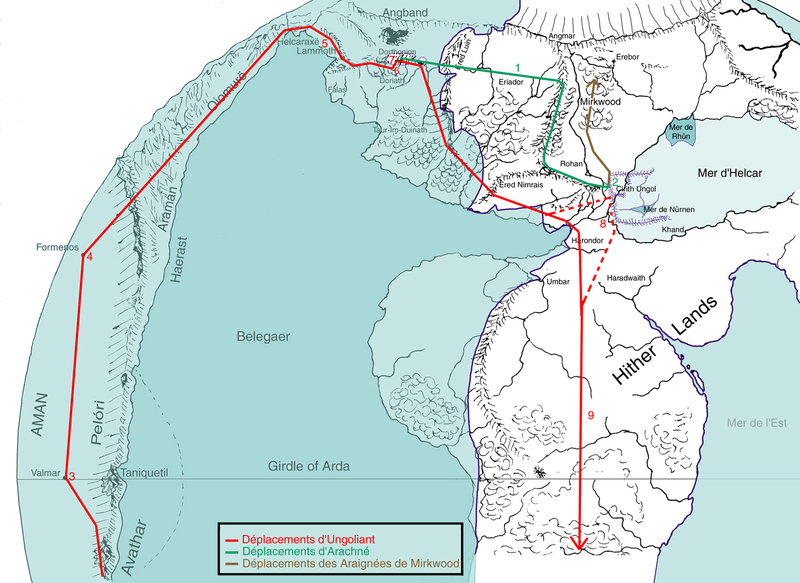 He ransacks the Noldorin Elves’ fortress at Formenos and steals treasures of gems, including the Silmarils, which he carries in their flight to Middle-earth. Once they arrive, Ungoliant demands her payment and Morgoth begins feeding her all the Elven gems of Formenos. Ungoliant grows “huger and darker” yet her “lust [is] unsated” and she insists that Morgoth surrender even the Silmarils. When Morgoth refuses, her “cloud close[s] about him” and she “enmesh[es] him in a web of clinging thongs to strangle him”. Morgoth cries out in anguish, “the greatest and most dreadful cry that was ever heard in the northern world”, and awakens “far beneath the ruined halls of Angband”, the ancient Balrogs who have been awaiting their Master’s return. It is only with the aid of the Balrogs and their whips of flame that the webs of Ungoliant are severed and Morgoth survives. The Balrogs attack “as a tempest of fire” and chase off Ungoliant, who flees south “belching black vapours to cover her” until she is secure in the dark vale of the Ered Gorgoroth to lurk out the rest of her dreadful days. The journey of Ungoliant and her offspring throughout the ages of Middle-earth. Click for larger version. 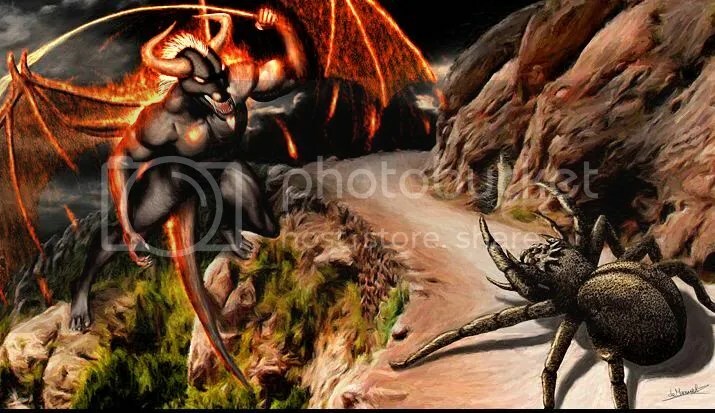 Fantasy Flight’s card art for Ungoliant’s Spawn is a piece by Andrew Olson whose other fantasy creations can be found on his blog. I consulted this online spider identification guide in an attempt to determine which spider Mr. Olson might have been using as reference and concluded that the “folding-door spider” eye pattern seemed most similar. Apparently, these spiders are called mygalomorphs and they retain many of the “primitive” features of the evolutionary ancestors of today’s spiders, including downward pointing mouthparts. Mygalomorphs are also the world’s largest and longest living spiders reaching a leg span of 28 cm and living up to 25 years. If Mr. Olson was indeed using a folding-door spider as the basis for Ungoliant’s Spawn, what we’ve learned from Tolkien’s lore suggests we should congratulate him for choosing wisely! A folding-door spider — the basis for Ungoliant’s Spawn? 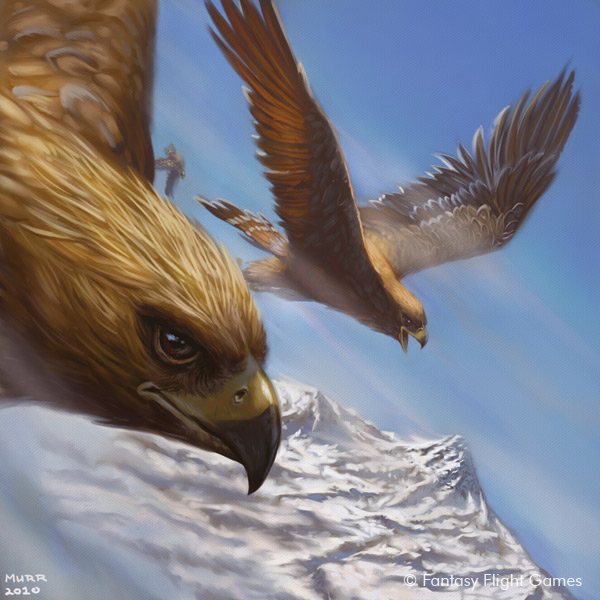 The second piece I’d like to feature is by professional Tolkien illustrator Ted Nasmith. Many of his works have been used as covers or illustrations for published Tolkien works. 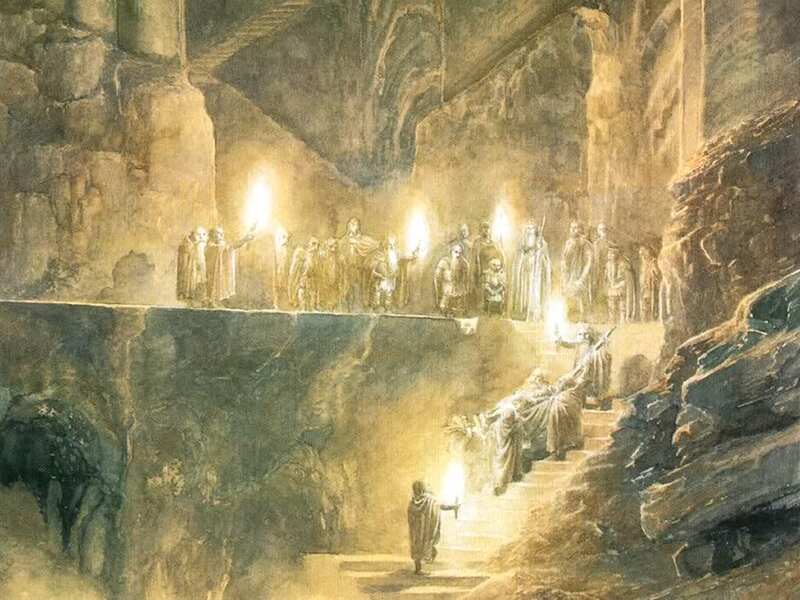 The selection below is one of the first images I ever saw for The Silmarillion the first time that I read the book. I find the strands of light dripping from Ungoliant’s maw to be particularly disquieting. An extensive collection of Mr. Nasmith’s other Tolkien artwork can be found on his website. This next piece is another vision of Morgoth and Ungoliant painted by the prolific realist artist Valerhon. If you like his style, he has dozens of pieces on his website including a tribute to Tolkien of Bilbo fighting Mirkwood spiders that is relevant to our current theme. Finally, my favorite Ungoliant artwork is this wonderful painting by Manila based artist Ruben Devela. While there are many fantastic visions of Morgoth and Ungoliant on the web, none depicts our foul mistress in a form so ludicrously larger than Morgoth, her former Master. Viewing this image, you almost feel sorry for the Dark Lord facing the ravenous lust for light that he has kindled in Ungoliant’s bloated desire. Check out Mr. Devela’s diverse gallery on DeviantArt, which I was excited to discover includes a street scene from my current home city of Hong Kong! In terms of thematic play, I think it’s a brilliant move by Fantasy Flight to make the chief enemy of the first quest in the game a character based on one of the most primeval villains of Tolkien’s work. 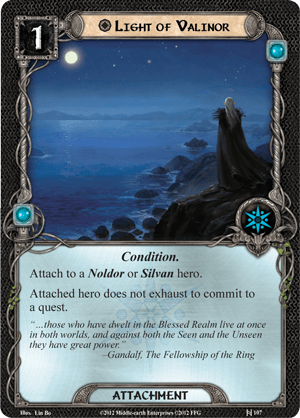 In my first play through, it was this card that clued me in to the fact that the FFG designers were really going to take their time to properly steep this game with the lore of Tolkien’s world. It would have been all too easy to simply name this enemy “Attercop” or “Mirkwood Spider” and let it go. More than anything else, it was seeing this first major shadow card titled with a reference to Ungoliant, a character mentioned by name only once in The Lord of the Rings and existing primarily in Tolkien’s more arcane writings, that turned me on to this game. For that alone, Ungoliant’s Spawn gets very high marks at the Master of Lore. 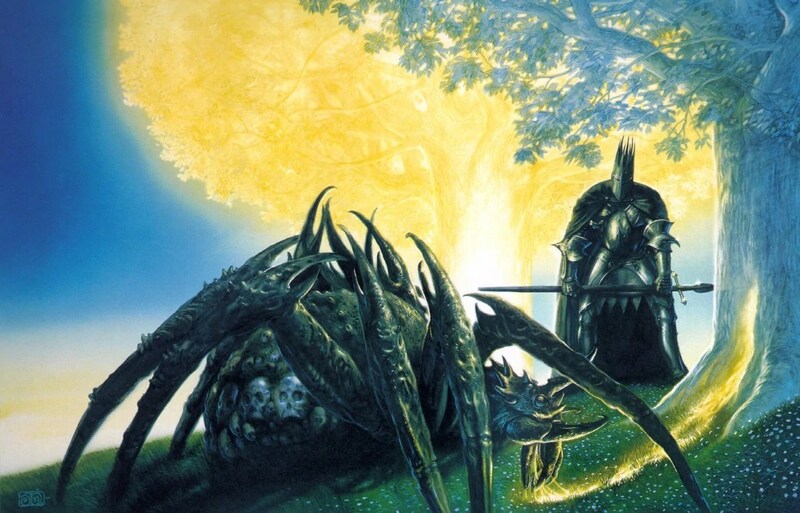 Since the light of the Two Trees of Valinor was the target of Ungoliant’s most infamous attack in Tolkien’s legendarium, in order for this spider spawn to make a kill that echoes with her grandmother thematically, she should be assigned to a hero who is bearing the Light of Valinor attachment. Also, since it was the Noldorin Elves whose King was murdered by Morgoth in the same battle and subsequently pursued him to Middle-earth, Ungoliant’s Spawn would be particularly thrilled to devour the Light of Valinor while it is attached to one of our Noldorin heroes (Elrond, his sons, or Glorfindel). As far as destroying Ungoliant’s Spawn, it’s too simple to suggest attacking with Bilbo or Frodo as per the Mirkwood and Shelob scenes in The Hobbit and The Lord of the Rings respectively (and not really possible anyways until we get a Sting or Phial of Galadriel with special spider repellent). I think I’ve come up with a cool thematic idea, but it would involve including the Ungoliant’s Spawn card in the encounter deck for the “Shadow and Flame” scenario of the Dwarrowdelf cycle, thereby giving you a chance to imitate the showdown between Ungoliant and the Balrogs of Morgoth that ensued over the Silmarils after they fled to Middle-earth. First make sure that Durin’s Bane is carrying its Many Thonged Whip and at least 9 wounds. Then when Ungoliant’s Spawn is revealed, lusting after the Light of Valinor, you play Infighting to make the Balrog turn on the famished fiend! The spider spawn will be driven off just like her ancient ancestor, with webs smote asunder by the fiery flames of wicked whips wielded by a minion of Morgoth. Unleash the Balrog on Ungoliant’s Spawn! My custom Ungoliant’s Spawn. Click for a high resolution version. Despite all this thematic fun, however, I do think that Ungoliant’s Spawn’s game text, like Ungoliant herself, desires more. Sapping 1 willpower from each character committed to the quest is understandable, as her webs would no doubt slow down the Company as they pass through Mirkwood. But given the three characteristics of darkness, gluttony, and lust developed by Tolkien’s text, I propose that we can do better. Here’s my custom version, which behaves more like Ungoliant, becoming “huger and darker” by devouring light and mating in the darkness to produce more “foul offspring”. Have a read on the left and let me know what you think! Hopefully (or horridly), this post has brought Ungoliant’s Spawn to life for you in new ways. Maybe you’ll even consider using my custom version or shuffling her into the encounter deck of other scenarios to experience her thematic awesomeness hungering after your heroes. No matter what though, as long as you keep playing the game and learning the lore, you will be participating in a lesser yet archetypal echo of Tolkien’s great story, just as each age of Middle-earth brings forth a lesser yet archetypal echo of the Elder Days passed long before. Another fantastic article! I was looking forward to seeing what you would cover next and I wasn’t disappointed. Ungoliant is definitely one of the most fascinating figures in the lore. I can only imagine what a card for Ungoliant herself might look like, but it would have to be nigh unbeatable. I do like your new version of the Spawn, we just need some more Light cards for it to feed on! I thought about making the custom Spawn take all Light cards in play or in your hand so that she could also devour the events A Light in the Dark, Risk Some Light, and Light the Beacons but simply ran out of room in the text box. Ungoliant herself would probably have the Indestructible keyword like Durin’s Bane tp be escaped from rather than destroyed. I’m glad you enjoyed the read! I really like your custom version of Ungoliant’s Spawn. I like when cards have powerful effects that right true to the underlying theme, especially when it happens to punish often-used strategies like Glorfindel + Light of Valinor. Another thoroughly enjoyable read, keep up the good work! Oh, my gosh! This was a fantastic article. Good gracious, I thank you as a fan of the game and as a fan of good writing and great research. 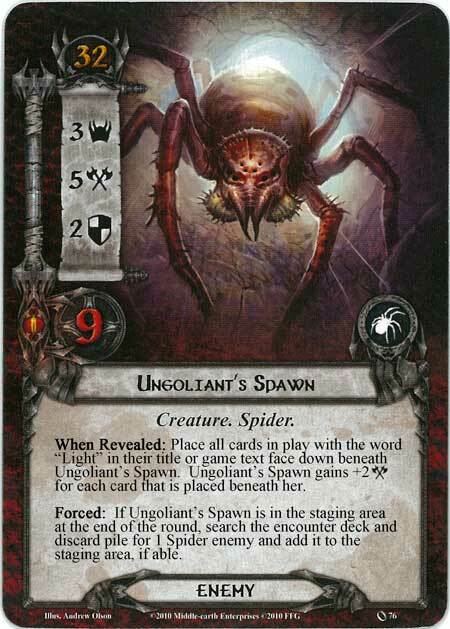 I do love the alternate card you created for Ungoliant’s Spawn. Have you played with it and does it work well? Your website will definitely be on my constant reading list. Great job, sir. Thank you sir, it’s been great fun to write. Both articles have taken nearly a full day of work to return to Tolkien’s text, scour the web and embed links, and create some original material (thematic play layout and custom card) but it’s been very gratifying to me so far. Knowing others have enjoyed reading just heightens the fun. Thanks! I fear I won’t be very prolific (didn’t have time to write an article this weekend for instance), but already have several more ideas that I’m eager to work up when I have the time. While I like looking at and considering custom cards, I never actually play them as I usually stick to the rules as best I can to have a comparable experience for when I read forums and blogs. I’m really enjoying your blog, great work! I made a favicon for the blog if you want. Thanks for the kind words! I’d love to check out the favicon. What’s the URL? It’s just the Lore sphere symbol (in miniature), if you pm me you email on facebook (click my comment), I’ll email it to you.. Your custom card is a great idea. Given that many people probably did not know who Ungoliant was, having the Light-devouring and spider-spawning abilities would have been a wonderful introduction. Given that Passage Through Mirkwood is relatively easy, this would also make it that much harder. With your two articles, I have learned much more than even I thought. I knew who Ungoliant was, for instance, but didn’t remember the battle between her and Morgoth. Keep up the good articles! One thing that it twigged in me, is that FFG should itself provide some literary references for the cards! It would not need to be as in-depth as you are making, but simply pointing out relevant passages that someone who cared could go look up for more information. Thanks Jean! A quick reference for me is The Complete Tolkien Companion by J.E.A. Tyler. I’d love to see book and chapter references for key passages relating to the cards though. Looks like you’ve got a fun blog project of your own started. I’ll be following your adventures! A wonderful article. My knowledge of the works of Tolkien pale in comparison tp your’s; but this inspires me togo back and re-read it allowing this time paying much more attention to the Silmarillion). Thank for a great blog and making a fun game even more so. Thanks Andrew, most of what I’ve written is stuff that I just learned researching for the article. Having readers that are interested in deepening their knowledge of the lore with me is what makes this all fun! When you think about it, the Original Spawn may be thematic : when it apear, it drain all light ( hope/will) from everyone. By the way I love to see the story behind the card and hope that you will continu your good work. Now that you mention it, I agree with your comment about the original Spawn devouring the metaphorical light from the Company. Thanks! As for Tyler’s work, I haven’t yet searched for a name from Tolkien’s text that didn’t have an entry. Granted, they are brief (far more so than the various online wikis) but Tyler writes with a literary style that emulates Tolkien and has fantastic sentence, paragraph, or page summaries that do capture the essence in a enchanting way that makes for a quicker handy reference than a Google search. thanks. I<m gonna check out this book on amazon. Loved this article. I wonder if you have had a chance to play the Passage Through Mirkwood Nightmare version recently released in the FFG Game Night Kit. It is very Spider heavy and does a good job of making Ungoliant’s Spawn even more terrifying. Keep up the awesome articles! No I haven’t but I’m intrigued. What modifications does the nightmare variant make to our esurient spawn? I am still fairly new to the LOTR LCG game. I just finished up the Shadows of Mirkwood cycle. I have always been fascinated by the lore that Tolkien created. A couple of weeks ago I bought the Tolkien companion book. Pretty neat stuff. And I have started rereading the Fellowship of the Ring. I decided to start at your beginning of your posts. This one was a tough one to read. I hate spiders. There were many times here where I had to use my hand to block a spider pic. You did a good job of research for this post. Well done. I look forward to reading more of your posts and learning many many things about Tolkien’s world. Hey Chuck! 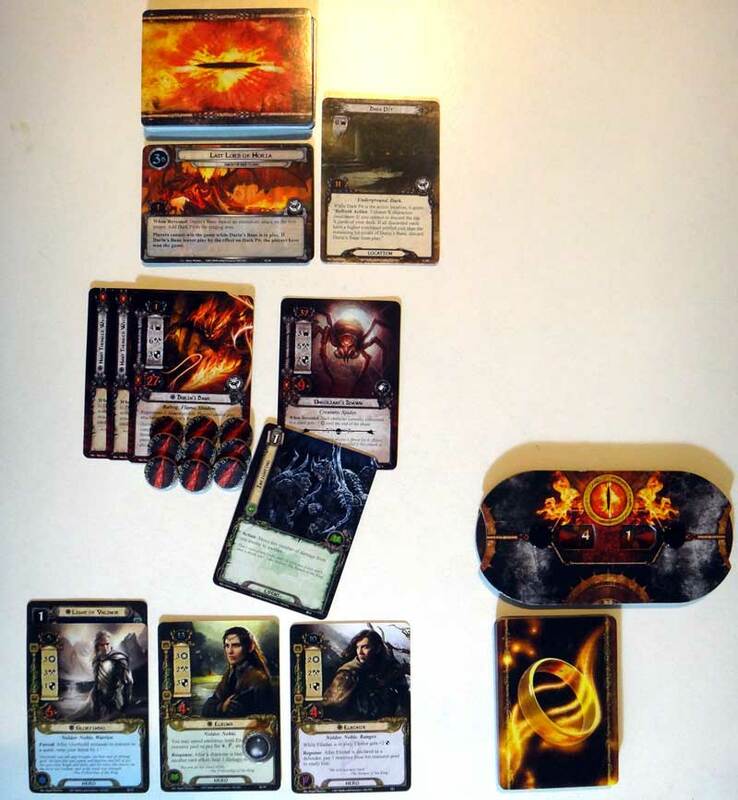 Welcome to the LOTR LCG and thanks for checking out my blog. I wish I could sorry for the spider pics but, like Tolkien, I guess I get some amusement from creeping people out. Are you coming to the game primarily as a gamer or a Tolkien fan? Either way, I hope you’ll enjoy. The online community around this game is great so be sure to check out Tales from the Cards, Hall of Beorn, Cardboard of the Rings, and many more in the various related links. Enjoy adventuring in Middle-earth and keep the comments coming! I’m a gamer and a Tolkien fan. I’ve been role playing since AD&D 2nd edition. Stupid THAC0. Been gaming since the Atari 7800. I am also a lifer/founder in LOTRO. I don’t really remember how or why I decided to order the base set from Amazon. Since when I get together with all my friends we are always role playing, it is nice to have a game that I can play by myself. 2 handed of course. I have visited all of those sites. I have been watching the 10th Nazgul (CotR) videos as I have been progressing through the quests. So, I’d watch the card review video then the quest video. Then I would play the quest myself. Awesome! I trust you’ll find tons of enjoyment from this game and community then. Welcome aboard and happy questing!